Over the summer, I drew up a “Cover 2 cheat sheet.” A guide for safeties to playing the deep half based on run/pass keys, releases and route stems. And after watching the tape of Wilson’s TD pass to Sidney Rice that beat the Patriots, the same rules apply for safety Tavon Wilson vs. the “Dino” stem (stem to corner, break to the post) in 2-deep coverage. Let’s check out the All-22 cut-ups of Seattle’s game winning play, talk safety technique, look at the route and get into some coaching points. 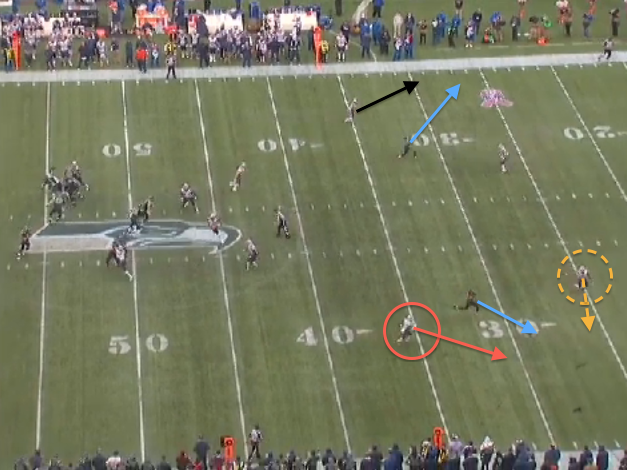 - This is a two-man route for the Seahawks. Open (weak) side run action with 8-Man protection. A boot scheme with Wilson rolling to the closed side of the formation after the play fake. Deep 7 route to the open side with Rice on the double-move. - I talk about Cover 2 all of the time and the techniques, landmarks, run/pass keys, etc. don’t change based on the team or coach. Two deep half safeties (highlighted in orange) with the Mike Backer running the inside vertical seam. 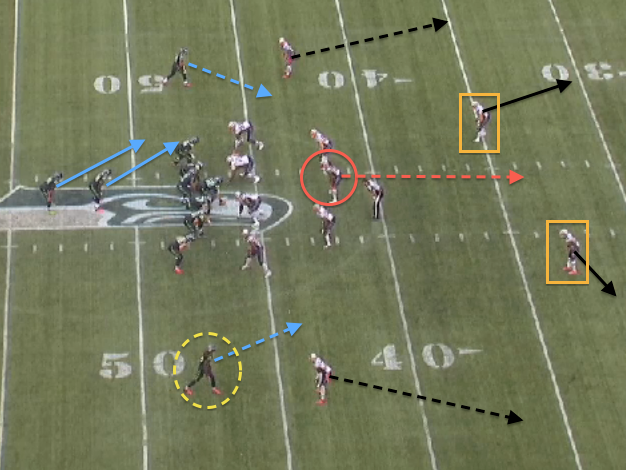 To the outside, both CBs will look to re-route (jam) No.1 (X and Z) to take some stress off the safeties. - Focus on the releases (highlighted in blue) from the WRs. This is a hard inside release. As I said above, you want your CBs to impact the initial vertical stem of the wide outs. However, on a inside release like we see here, the CBs won’t “chase" inside (this impacts their ability to recover vs. a possible flat route). Instead, they will sink at a 45-degree angle and cushion the safety on the possible 7 cut (corner route). - Field position: ball in-between the 40’s. This should be an automatic alert for the deep ball from the perspective of the defense. Ideal field position for Wilson to take a shot. - Poor eye placement. Again, the No.1 reason DBs and LBs get beat (or put themselves in a tough position) is their “eyes.” Look at the Mike Backer (highlighted in red). He is attacking the line of scrimmage. High Hat=Pass, Low Hat=Run. - Now move back to Wilson (highlighted in orange). There is no reason to stick your eyes in the backfield as a deep half safety. Read the release of No.1 (Rice). He will tell you the story every time. This is a “pass” read based off the inside stem at the line of scrimmage. - Route stems. 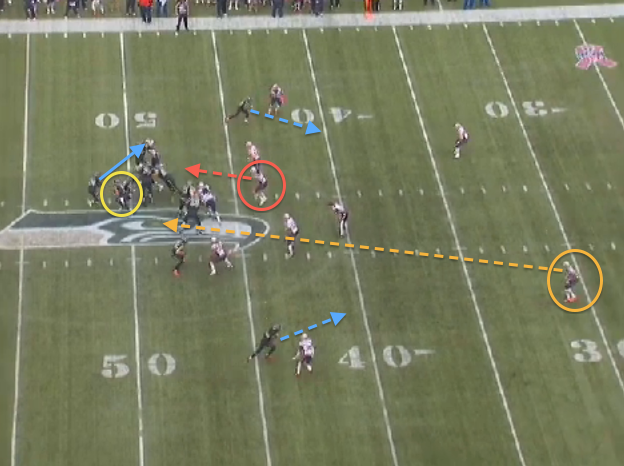 Playing Cover 2, an outside release equals only two routes: Fade or comeback. However, with an inside release you have to play for the 6 (Dig), 7 (Corner) or 8 (Post). Stay square, read the break of the WR (between a depth 12-15 yards) and drive on the throw. - This is where Wilson gets into trouble. Because he was looking in the backfield, the rookie has to get his eyes back to Rice and play the double-move. 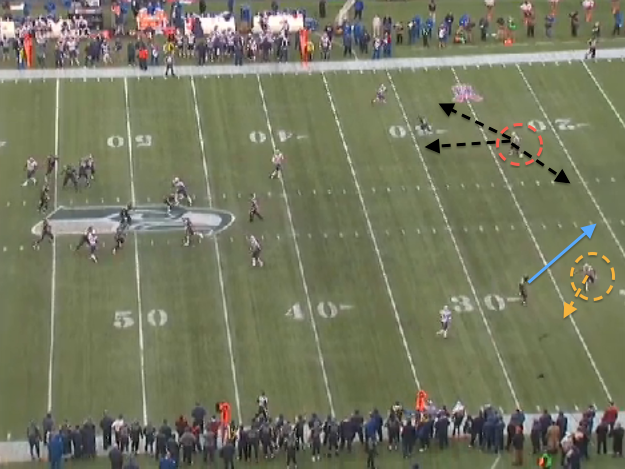 However, instead of staying square, the Patriots’ safety opens his hips to prep for the 7 cut. - I wanted to highlight the CB here (red). As a safety you have to remember that you have help on the 7 cut with the corner sinking. Plus, with no threat in the flat, the CB can play this in almost a “trail” position and increase his depth throughout the route stem. - Once Rice breaks to the 8 (post), Wilson is beat—and panics. Instead of using a “closed angle” technique (head whip), the safety opens to the QB, takes a “bucket step” (step behind) and allows the Seahawks’ WR to create even more separation. - I highlighted the safety to the open side of the field (red), because this is the proper technique in Cover 2. Stay square and put yourself in a position to drive the dig, corner or post. - Great call and execution from the Seahawks to use the deep play action out of regular personnel. This wasn’t a perfect route from Rice, but he sold the stem to the 7 and was able to take advantage of some poor technique (and eyes) from the Patriots rookie safety. - It’s tougher than you think. And to be fair, I gave it up for six points during my NFL career. Just ask Kurt Warner—the QB who threw it over my head. But it all comes down to technique and recognizing the game situation. 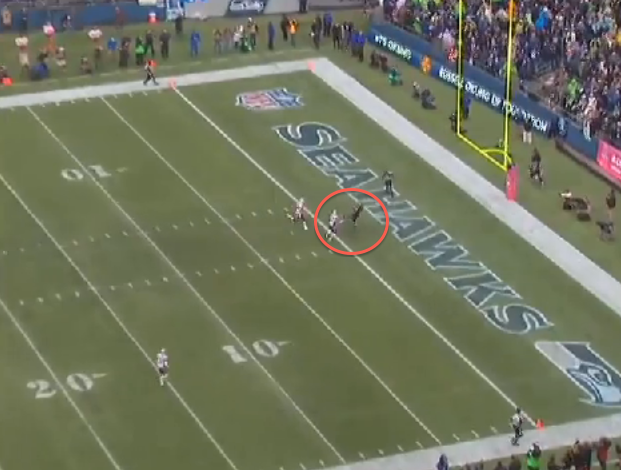 With Wilson, he was beat at the snap of the ball when he took the bait of the play action and tried to recover vs. a deep, multiple-breaking route. What's sad about this play is that he bit on the play action when they needed to go 50 yards in a 1:18. The run had been stuffed all day long.... Why the Fvck is he biting on play action in that situation????? ?